A unusual variant state of Ernest Dudley Chase's map of the British Isles. Signed by Chase in the lower left, just under the copyright. 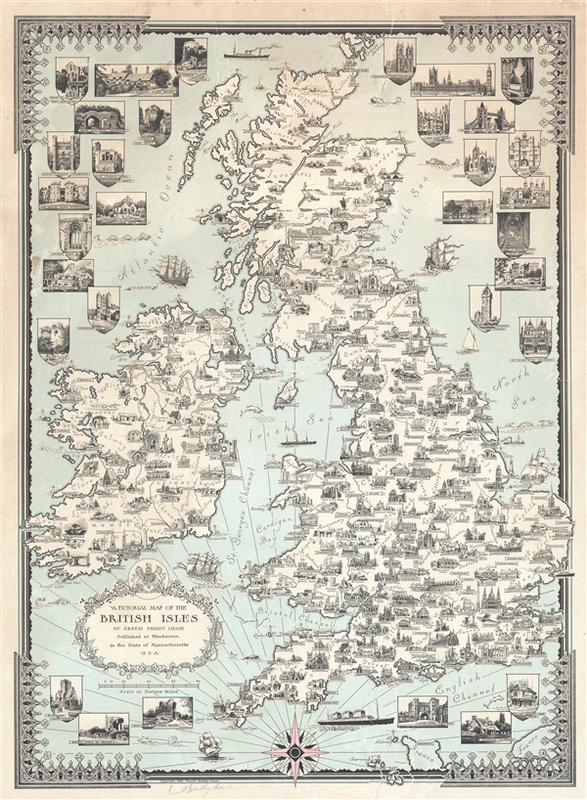 A Pictorial Map of the British Isles By Ernest Dudley Chase. An uncommon signed 1935 pictorial map of the British Isles by Ernest Dudley Chase. The map covers all of England, Scotland, Wales, and Ireland. Chase uses the most important building in each town, usually a church or lordly manor, to symbolize the whole. London for example is represented by St. Paul's Cathedral while Chester by the ironically Tudor Chester Rows. Surrounding the map, in the oceans, further images illustrate famous castles and other sites such as London's Old Curiosity Shop (immortalized by Dickens). The map features Chase's iconic gothic borders. It is signed by the artist in pencil in this customary location in the lower left just below the copyright imprint. This map is dated and copyrighted 1935. There are two established states of this map, the original uncolored state published in 1935 with a copyright date and a second full color edition published c. 1939 wherein the date on the copyright has been scratched out. The present example is neither and represents a heretofore unknown intermediate state. The copyright remains with the date, but light blue color has been added to the oceans. We have been able to identify no other examples with similar coloring. Good. Map exhibits some repaired tears and abrasions. Backed on archival tissue. Rumsey 8612.000, 8040.000. OCLC 866834759.